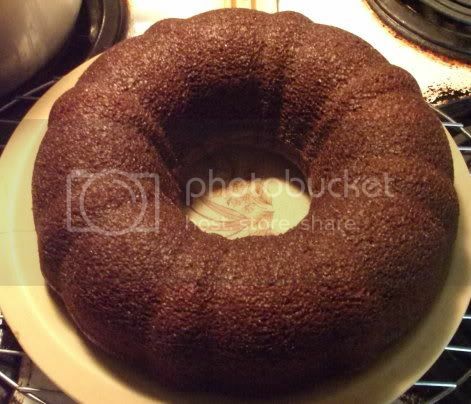 Labor Day Last Hurrah — Chocolate Bundt Cake! During the summer, my church has a picnic after services every first Sunday of the month. This year, I’ve been trying to contribute a tasty vegan item. Fortunately, everyone is pretty open to trying new things, so I’ve had a chance to share baked mac & “cheese”, chickpea “tuna salad” and, this month, chocolate bundt cake! I’ve been eyeing the “Lower-Fat” Chocolate Bundt Cake recipe in Veganomicon for a while and decided to try it out. Any recipe that starts with “1 3/4 cup freshly brewed coffee” is enough to catch my attention! I also like that it substitutes applesauce for a portion of the oil–making it moist instead of greasy, and lower in fat if you’re concerned about that sort of thing. Before heading off to the picnic, it will get a dusting of powdered sugar, but I think it would also be pretty awesome with a light chocolate drizzle. Question for the comments: What’s your favorite vegan picnic food to share? It really is! ^_^ I’ve been trying to bring a vegan dish to each picnic, and sometimes I bring vegan cookies to Bible study. 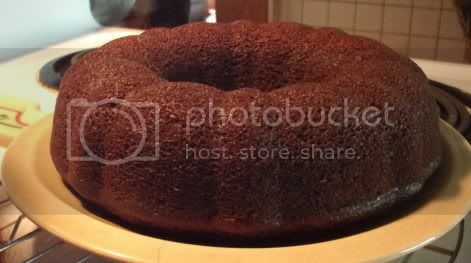 That bundt cake looks great! Hmmm, I think I like bringing salads to picnics, sometimes potato salads too.